Growing up Rice Krispy treats were like a household staple, and quite possibly the most fun dessert we made. I remember helping my Mom make them for different occasions, and always thinking that some day I would make them with my kids. Recently I had a craving for rice krispy treats made from Cocoa Krispies, and wanted to do something a little different with them. While sitting up late one night, in bed with my Hubby, we went over a few possibilities. (He's so awesome!) Eventually coming up with a Cocoa Rice Krispy treat with a peanut butter fudge and a chocolate ganache topping. I got your attention now huh? These were pretty freaking awesome, if I do say so myself. Now I don't do desserts all that often, I'm more of a breakfast/dinner kinda girl. I love a good dessert, just hate the mess of baking. But these were surprisingly easy, and totally decadent and delicious! I made them about a month ago when my Brother In Law came over for dinner, and with him being the pickiest member of my in law family, I never honestly know whether he'll like what I make or not, but this particular evening with Buttermilk Chicken and Mashed Potatoes for dinner, and this for dessert... Honestly I've never seen him eat so much so fast! lol! So I think that was a good sign that these were pretty bomb. My little sous chef absolutely loved helping make these, and enjoyed eating them even more! Just one piece of advice... Make sure you have milk on hand to go with these! They're rich, and worth it!! In large saucepan melt butter over low heat. Add marshmallows and stir until completely melted. Remove from heat. Add Cocoa Krispies, stir until well coated. 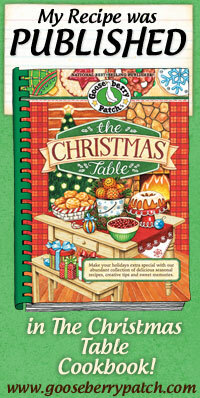 Using buttered spatula or wax paper evenly press mixture into 13 x 9 x 2-inch pan coated with cooking spray. In microwave-safe bowl heat butter and marshmallows on HIGH for 3 minutes, stirring after 2 minutes. Stir until smooth. Remove and add in the Cocoa Krispies and stir until well coated. Using buttered spatula or wax paper evenly press mixture into 13 x 9 x 2-inch pan coated with cooking spray. Microwave cooking times may vary. Once treats are done, let chill in the fridge for about 1 hour. Then in a medium sauce pan combine the sugar, milk, shortening, margarine and salt. Bring to a rolling boil, stirring constantly to prevent scorching. Once it reaches a boil, let it boil for 2 minutes without stirring. Remove from the heat and add in the vanilla and peanut butter. Pour on top of the Krispy treats, it will sink in and create a fudge within the treats. Cover with foil and chill again for 1 hour. Once chilled, make the ganache's by cooking the heavy cream and chocolate chips in the top of double boiler's over simmering water until smooth and warm, stirring occasionally. *You are making both a white chocolate and semi-sweet ganache*. Once done, pour the semi-sweet ganache over the chilled treats, and spread out. Then drizzle the white chocolate over that with a fork. Chill until ready to serve. These fall into the easy, but slightly time consuming dessert category. However overall they were pretty simple, and absolutely worth the extra work! We give these 5 stars, and I will totally be making these again soon! P.S. 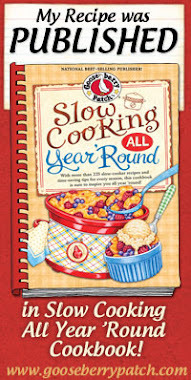 Don't forget to enter my Giveaway going on until April 22nd, and enter to win a great cookbook! I think these would be great for an Easter Treat..not that we won't have enough candy already! These should be called Rice Krispies Extreme...LOL. I love to make cocoa krispies treats. Such a good idea to add the peanut butter and more chocolate on top. Makes it like a fancy grown-up version! Oh my heck! I must make these and eat them all. Amazing!!! 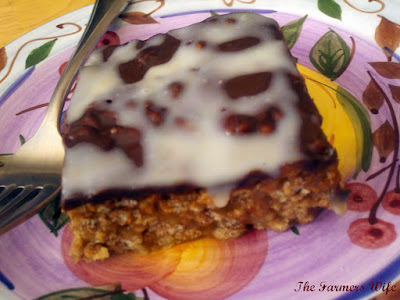 I am really liking the peanut butter fudge, makes these more decadent! Peanut butter makes the world go round. This sounds so delicious. Fudgey, chewy, crispy, chocolatey. Great! I love that your husband sits up in bed to discuss rice krispy possibilities. :) That is so sweet. I checked out that buttermilk chicken, sounds delicious, I'll have to make that! You are right. These cocoa krispies, peanut butter fudge, chocolate bars are over the top! I love all of your guys comments! I would love to have y'all over to enjoy these treats! Ohh my dear..this looks so fantastic and delicious! Great recipe too..thanks so much for sharing!!! Who doesn't love rice krispie treats?? These look over the top fantastic! The ganache on the top just puts this over the top! Yummy!! Love your blog and I wanted to pass something along... An award is waiting for you here http://cookingitalianinthemidwest.blogspot.com/2011/04/awards-galore.html. Hope you enjoy it! Brilliant! It's like a grown up version of the classic....droolworthy. Oh dear. These look like trouble! oh my goodness,these look amazing. peanut butter, chocolate and krispies - what's not to love? Oh my! Peanut butter fudge with the krispies and decadent chocolate ganache? What cruelty. I'm needing one or two right now. I just love how it's also a team effort with hubby helping you devise such a gorgeous creation. That is just so lovely (ok, I'm jealous: wish mine would help think up, he eats up). Great post! Wow - these look SO GOOD!!! Can't wait to try them! Thanks for participating in April's YBR :) They look so good! I'm just reading this from your holiday tips and they sound fantastic. I'd love it if you would enter them in my virtual cookie swap & giveaway by mentioning g them and providing a link to this post. I think everyone would love them. I know I'm going to make them.